Side Mount "for 1" emt tubing"
Fits Hoops made of 1" emt tubing. Securely and quickly mount your hoops or any 1 3/8" fence tubing to any vertical wood structure such as post or buildings with these side mount adapters. 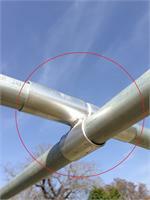 Plastic Snap Clamps for 1" emt tubing are used to attach Agribon, Dewitt or Poly covering to 1" emt metal tubing hoops. Clamps may be white or green depending on our stock. 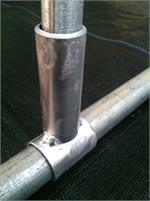 For use with 1"emt metal tubing. 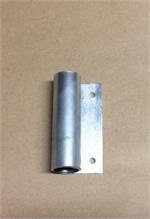 Used in our chicken tractor door or any where you need a hinged opening. Tech screw one side and allow the tube freely rotate in the other side. One Each....For Low Tunnel hoops made using 1" emt tubing. Use these connectors anywhere you need to connect 1" emt straight tubing perlins length wise to your 1"emt hoops. (screws included). 16 Pack....For Low Tunnel hoops made using 1" emt tubing. Use these connectors anywhere you need to connect 1" emt straight tubing perlins length wise to your 1"emt hoops. (screws included). 4 Pack....For Low Tunnel hoops made using 1" emt tubing. Use these connectors anywhere you need to connect 1" emt straight tubing perlins length wise to your 1"emt hoops. (screws included). 8 Pack....For Low Tunnel hoops made using 1" emt tubing. Use these connectors anywhere you need to connect 1" emt straight tubing perlins length wise to your 1"emt hoops. (screws included). 1" Tee connector (16 Pack) for attaching 1" emt hoops to a 1" emt base rail or any application where 1" emt must be connected at 90 degree angle. Allow a 4 way connection for 1"emt tubing with the center being a pass through. Just the axle hubs. 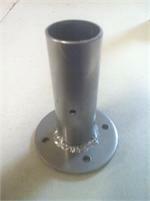 Fits any base frame made from 1"emt tubing.Axle Carriers sold separably. NEW! 150 degree connector is designed to be used with 1" emt tubing. Modified Gothic Hoop Design and other applications. This design is perfect for snow regions. This hoop house design is a result of collaboration between myself and Eliot Coleman. Our Scissor door setup fits both 1" emt or 1 3/8" tubing & is the proven best method to quickly open the entire ends and ventilate your hoop house as well as the most economical greenhouse door system anywhere. Improved even more with our Bottom Latch. 16 Pack wood deck adapters...Use to quickly attach 1" Hoops to any wood deck or wood side rails. Can also be used to attach 1 3/8" hoops to any wood surface. Requires 2 connectors per hoop. 4 Pack wood deck adapters...Use to quickly attach 1" Hoops to any wood deck or wood side rails. Can also be used to attach 1 3/8" hoops to any wood surface. Requires 2 connectors per hoop. 8 Pack wood deck adapters...Use to quickly attach 1" Hoops to any wood deck or wood side rails. Can also be used to attach 1 3/8" hoops to any wood surface. Requires 2 connectors per hoop.